Comes on, the herald of fair Flora's train." My garden suffered some neglect during the two years we lived a little ways north. I'm eager to get it back into shape, but will have to wait a wee bit longer for the rain to lessen. Until then, I wander around, poking around, seeing what's survived. Seeing these nodding snowdrops yesterday made me so happy. And in another spot, the very first tips of daffodils are emerging from the ground. I'm linking this post to Mosaic Monday, hosted by the ever-gracious Mary at the Little Red House. And on a different topic, Mater of Mater Familias Knits, tagged me in a meme. I don't participate often, but this one sounds fun. It's also long, so I'm taking extreme liberty with the rules and breaking it into two posts. Today, I'll post 11 random things about myself, and tomorrow I'll post the rules and answer Mater's questions. 1. I'm the eldest of three children. 2. My sister and brother insist that the only memories they have of me as a child is with my nose in a book. They exaggerate, but I have always devoured books. 3. Although our family was small, I have 17 pairs of aunts and uncles, and 56 first cousins. Both of my grandfathers fled Russia during the post-WWI revolution because of persecution against the Mennonites. My grandmothers' families had come to Canada earlier and were also of Mennonite heritage. I loved growing up as part of a huge extended family. 4. My favourite colour is blue, but I probably look better in pink tones. 5. I was married at 20, got my first degree at 22, and at age 24 my husband and I moved to Ecuador, South America to work with a Christian non-profit organization. We went for four years and ended up staying for almost 21 years. 6. Our three children were born in a small hospital on the edge of the Amazon jungle. When I went into the hospital with the first, I noticed a cockroach in the corner of the bathroom and wondered how I could ever give birth in a building that housed cockroaches. After a few hours of labour, I wouldn't have cared if a tribe of cockroaches broke into song and serenaded me with "La Cucaracha." 7. We returned to Canada in 2002, settling on our Island because my husband found work here. It's a great place to live. 8. I'll take salty and crunchy over sweet and mushy any day. 9. Dark chocolate is the exception to the above, especially if sprinkled with a little sea salt. 10. I obtained my second degree (a BA in French) at 54, just last fall. I love languages, and speak Spanish as well as French and English. 11. Creativity is in my blood. Making things with my hands, by sewing, painting, stitching, cooking or decorating is something I have to do. Pretty snowdrops. I can't believe anything is that green as far north as I know you are. The joys of the Pacific Southwest. That sounds so strange...is that how you describe your area in Canadian terms? Fifty-six first cousins? Wow. And I thought I was part of quite a group with 18. Guess not! So many interesting things you've done in your life and continue to do. So nice to get to know you that much better! Were your ears burning this evening? I had dinner with a fellow blogger and your name came up in the nicest way. We'll have to meet for coffee and a bit of needlework soon! 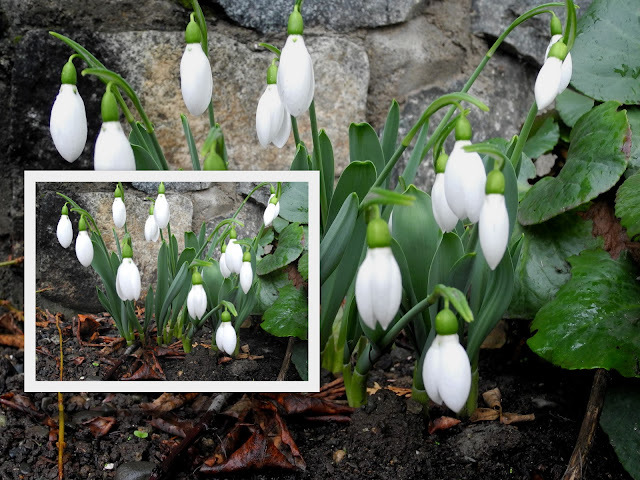 Love your snowdrop collage, so fresh and clean looking. I enjoyed learning more about you, some things I already knew of course but cockroaches singing la cucaracha was a new one!? Snowdrops are just the sweetest flowers - shy with bowed heads, beautifully cupped - exquisite in their simplicity. Best of all they herald Spring and the promise of Summer to come - what better news could they bring!! Lovely to learn more about you Lorrie. Wishing you a wonderful new week - tomorrow is the last day in January.... where did the others go? The snowdrops are so pretty. Loved getting to know you better through that meme. 21 years serving in Ecuador on your life resume is pretty amazing! Such beauty! Why do we give even a moment of space in our heart's to worry? The same mighty God that created these snow drops in the cold is taking care of us.Thank you for the reminder. Wow, you have had an exciting life, very adventurous! What a beautiful mosaic, the flowers are so pretty! You must have some wonderful stories to tell about your rich life experiences! Lovely shots of the snowdrops. It is nice to learn all about you. a fun post. Have a great week! You have a very interesting life, Lorrie. I wish I had the gift of learning different languages quickly. I love your snowdrop flowers..they look so delicate. It has been an unusually mild winter here in the NE so we might also see our blubed flowers poking out of the ground soon. What pretty little flowers...and it was fun learning more about you. Have a great week, saw Melissa and the boys yesterday. Corban is missing his 2 bottom front teeth, and Keegan is one busy little boy! They are so sweet . Wow! what an interesting post! At first, I was captivated by your snowdrops, but then I read the rest of your post, and I think you have led a very interesting life to date. You always leave me such kind and lovely comments. Thanks for following my blog, even with my sub-par photog skills. I'm working on them a little at a time, by the trial-and-error method. I always love these little tidbits and am so impressed you completed your second degree at 54. Students struggle after missing a year or two of school. To go back long after your first degree, with much time in between, is an accomplishment itself. Congrats! Your snowdrop flowers are calling me to visit my local nursery. They'd be perfect in our yard. Thank you for serving God in Ecuador. I imagine it was tough, but rewarding. What an adjustment you must have had moving back. Thanks too for sharing your life story today as well as in your blog. I can't imagine dark chocolate with sea salt...it doesn't sound very appealing. But then, I didn't fancy dark chocolate with chilli until I tried it - wonderfully mysterious and warming!! I love the snowdrops photo. They - and lily-of-the-valley - are my two favourite flowers. Your snowdrops are lovely, and I love your mosaic. I've been working my way through a Lindt bar -- dark chocolate with sea salt -- mmmmm! What a fascinating life you've led -- married even younger than I was (21 for me), and so young to head off together to such a faraway place. As I've mentioned here before, I think, I envy you that BA in French -- it's a life goal that got dropped along the way, for me, but perhaps after retirement . . . I love the Snowdrops! I don't think I've ever seen them growing here in TX. I also love your list and am totally on board with the chocolate and sea salt! That is just the peaceful sight I needed today! Loved reading about you...you would be surprised about all the things we have in common. Always fun to get to know more about you Lorrie. What an interesting life! How lovely to get to know you better. Thanks to for sharing those gorgeous snowdrops. I'm sure it will be a few weeks yet, before we see any blooms here, so I will enjoy yours for now.